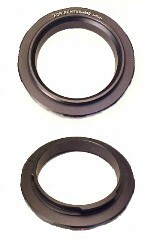 Here is a 46mm-49mm lens coupling ring male - male. This is a very handy device indeed. You can use two lenses at a time mounted front to front to do some heavy duty close up work. The ring has 46mm threads on one side and 49mm threads on the other so you can mount one lens in the reverse position on the front ring of a lens that is attached to the camera. This is not a ring you see everyday. Macro-photography is one of my favorite forms of photography. You will be surprised to see what is lurking just out of site. You will have so much fun you will hardly be able to stand it! To give an example of what this will do, I will use this illustration, results may vary depending on your lenses, this is just a ballpark figure from what I have here. If you use a 55mm Macro lens that has a 1:1 ratio capability and take a photo of a dime you will get almost a full frame of the dime. With this ring attached to that lens and then screwed in to a 50mm lens on your camera you will get a full frame of the date on the dime. This is for extreme Macro and you can use it with any kind of lens that has a 46mm or 49mm front ring. 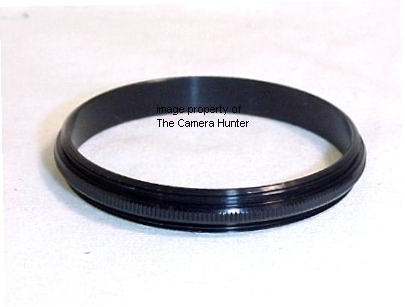 Here is a 52mm-52mm lens coupling ring male - male. This is a very handy device indeed. You can use two lenses at a time mounted front to front to do some heavy duty close up work. The ring has 52mm threads on both sides so you can mount one lens in the reverse position on the front ring of a lens that is attached to the camera. 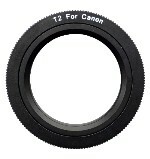 This is for extreme Macro and you can use it with any kind of lens that has a 52mm front ring. 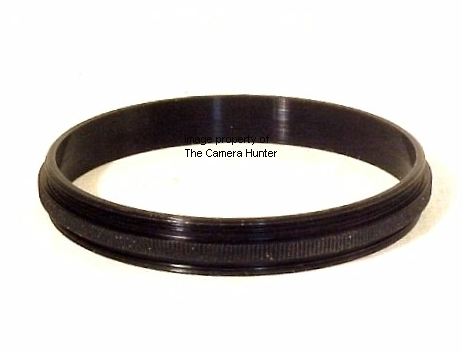 Here is a 55mm-55mm lens coupling ring male - male. This is a very handy device indeed. You can use two lenses at a time mounted front to front to do some heavy duty close up work. The ring has 55mm threads on both sides so you can mount one lens in the reverse position on the front ring of a lens that is attached to the camera. This is for extreme Macro and you can use it with any kind of lens that has a 55mm front ring. 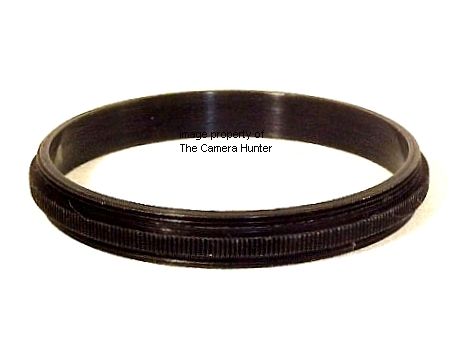 Here is a 58mm-58mm lens coupling ring male - male. This is a very handy device indeed. You can use two lenses at a time mounted front to front to do some heavy duty close up work. The ring has 58mm threads on both sides so you can mount one lens in the reverse position on the front ring of a lens that is attached to the camera. This is for extreme Macro and you can use it with any kind of lens that has a 58mm front ring. 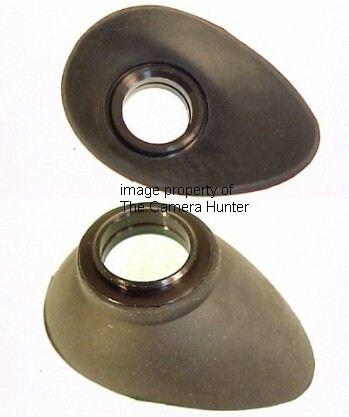 Here is a brand new rubber eye cup for your Konica Autoreflex camera. This product was discontinued many many years ago. I just happen to have some old stock. Once they're gone they're gone forever. It will fit all the Konica Autoreflex cameras with a 18mm round threaded viewfinder hole, they are all the same size. I believe the complete list of cameras are the A, T, T2, and T3 but there might be a few more that I have not identified. I really like having one on my camera. My favorite thing is that it makes the viewfinder readout easy to see even on a bright and sunny day. The metal piece slips onto the eyepiece of your camera. Prevents unwanted light from effecting your judgment of the image you are producing. Also prevents eyeglass lenses from getting scratched. Makes shooting more comfortable. I like this kind better than the original manufacturers because they are bigger, covering your whole eye socket. The rubber portion can be taken off or slipped around the ring to accommodate either the right or left eye. If you use a round drop in correction lens there is a space and retaining ring to hold them. 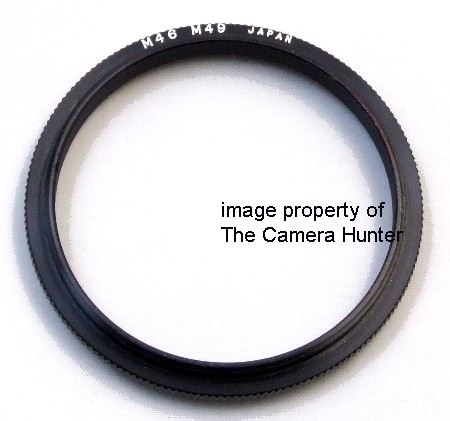 Here is a brand new Nikon 52mm lens reversing ring for extreme Macro close up photographs made in JAPAN. Macro-photography is one of my favorite forms of photography. You will be surprised to see what is lurking just out of site. You will have so much fun you will hardly be able to stand it! To give an example of what this will do, I will use this illustration, results may vary depending on your lenses, this is just a ballpark figure from what I have here. If you use a 55mm (focal length) Macro lens that has a 1:1 ratio capability and take a photo of a dime you will get almost a full frame of the dime. With this ring attached to the camera the lens mounted in reverse you will almost get a full frame of the date on the dime. This is for extreme Macro and if you use longer lenses with Macro capability you will get ultra close to the smallest subjects! The threads are 52mm so the front ring of the lens you want to mount in the reverse position needs to have a 52mm front ring. You can also use step up or down rings to make this fit other lenses that are bigger or smaller than 52mm. This is for the Nikon manual focus film cameras, auto focus digital cameras, and all Nikon digital SLR cameras. 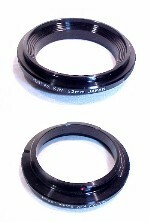 Here is a brand new Pentax K Mount 49mm lens reversing ring for extreme Macro close up photographs,.made in JAPAN. Macro-photography is one of my favorite forms of photography. You will be surprised to see what is lurking just out of site. You will have so much fun you will hardly be able to stand it! To give an example of what this will do, I will use this illustration, results may vary depending on your lenses, this is just a ballpark figure from what I have here. If you use a 55mm (focal length) Macro lens that has a 1:1 ratio capability and take a photo of a dime you will get almost a full frame of the dime. With this ring attached to the camera the lens mounted in reverse you will almost get a full frame of the date on the dime. This is for extreme Macro and if you use longer lenses with Macro capability you will get ultra close to the smallest subjects! The threads are 49mm so the front ring of the lens you want to mount in the reverse position needs to have a 49mm front ring. 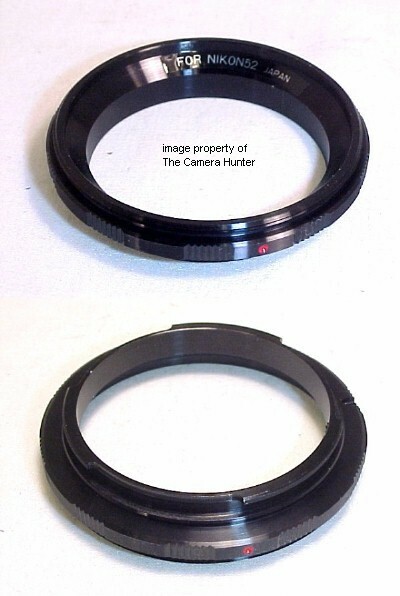 You can also use step up or down rings to make this fit other lenses that are bigger or smaller than 49mm. This is for the Pentax manual focus film cameras, auto focus film cameras, and all Pentax digital SLR cameras. Here is a brand new Pentax K Mount 52mm lens reversing ring for extreme Macro close up photographs,.made in JAPAN. Macro-photography is one of my favorite forms of photography. You will be surprised to see what is lurking just out of site. You will have so much fun you will hardly be able to stand it!